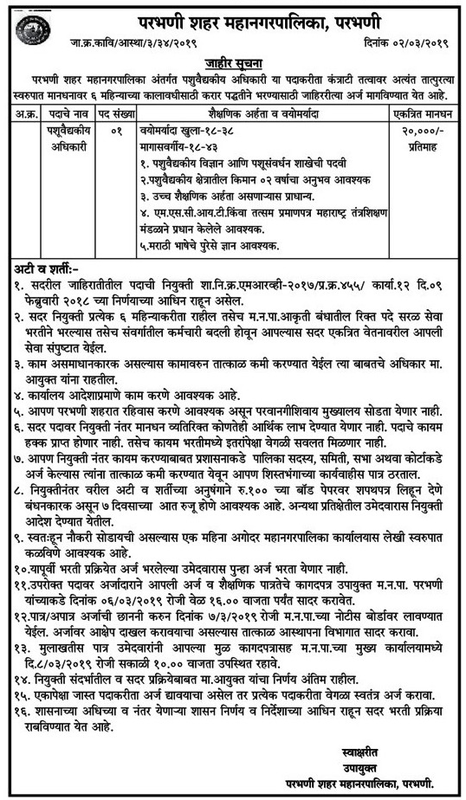 Parbhani Mahanagarpalika (Parbhani Municipal Corporation), Parbhani published a new job notification for Veterinary officer Post. The recruitment is for total 01 Vacancies. The willing candidates are informed to see the latest notification March 2019. Qualification required Animal Husbandry Degree, MSCIT and More. Last Date of offline application is 06-03-2019. For More details of Parbhani Mahanagarpalika Recruitment 2019 Read Below. Education Qualification: Animal Husbandry Degree, MSCIT and More. For Post wise Education Details follow the detailed advertisement. Age Limit: 18 to 38 Years & For Backward category Candidates is 18 to 43 Years. Interested & Eligible candidates can send their application along with all the necessary documents and testimonials to उपायुक्त म.न.पा. परभणी. Application starts offline 01-03-2019. Last Date of application is 06-03-2019.